Inspire Bingle: Mistakes: Makes Us Learn For Better Ourselves. Mistakes simply show us something that we didn't already know. Hmm... It sounds like those dreaded mistakes that we're so afraid of... and those dreaded mistakes that we try so hard to avoid... don't really have to be looked at as dreaded mistakes and painful experiences after all. We can view our mistakes through a different lens and now see a friendly, lovable mentor, or a caring, patient teacher, or maybe even a wise and winning coach that is just trying to point something out to us that we need to know, but don't already know. So I guess it would be beneficial for all of us to change our paradigm of mistakes from one of a foe to one of a friend. Changing this paradigm though will require one to control their thoughts. Thoughts become things. Negative thoughts put us in closer proximity to negative things. The good news is that we can avoid this negativity trap by just changing or model or paradigm of what mistakes really mean to us. We must control our thoughts. 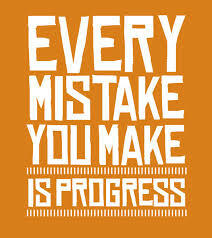 We must believe that mistakes are an old wise mentor pointing out a few things that we don't know yet. This new way of looking at mistakes pushes us into taking action and helps us stop small mounds of trouble from growing into massive mountains of misery. We can avoid the Mt. Everest shadow from over-taking us by just being grateful for the small mistakes that we make today. Those small mistakes of today are just pointing out some small things that we don't already know while simultaneously helping us avoid the big, ugly, and nasty mistakes lurking in the shadows of tomorrow. Share your thoughts and stories in the comment section. See you there! Before you go: please share this story on www.facebook.com, RT on www.twitter.com . Follow us at www.facebook.com/uniquetosuccess and www.twitter.com/devang_kadel. Subscribe to receive email updates. Thank you for your support!